In this age of smart devices and appliances, the sheer number of available options continue to grow – as does the variety. So, it only makes sense for an established ceiling fan manufacturer to modernize their product line by equipping these stationary fixtures with “smart” features to offer consumers. Enter the Hunter Symphony Ceiling Fan With Wi-Fi capability. Anything less than smart just doesn’t cut it anymore – at least for those of us who enjoy the ultimate in convenience, accessibility and low-maintenance living. And let’s face it, once you’ve grown accustomed to a single smart appliance, other appliances just seem outdated – and even annoying to use. 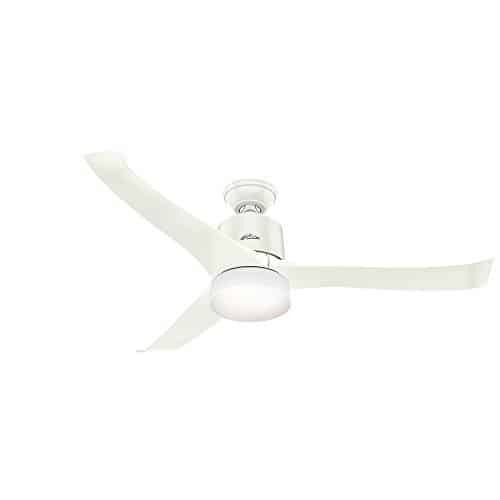 Hunter has stepped up to fill the void with it’s Symphony Ceiling Fan with Wi-Fi. It features a contemporary look and stylish design with clean lines and a glossy white finish. Since it’s WiFi-enabled, you would think the Symphony would be the ideal solution for the high-tech enthusiast who values anything that’s convenient and easy to use. As a ceiling fan and light fixture, the Hunter Symphony performs exceedingly well. But as a smart device, well, let’s just say there have been some issues. More about this in a moment. Back in time, before smart ceiling fans existed, anyone with even a basic mental aptitude could figure out how to get a ceiling fan/ light fixture to work exactly as it was designed to. Adding the latest technical advantages designed to make lives easier should be a simple thing for buyers to implement. It shouldn’t cause the buyer endless frustration and stress trying to get it to work properly. Yet that’s exactly what has happened, according to the previous customers. While most early buyers seem happy – even extremely happy – with the function of the fan and moderately happy with the lighting, many were disappointed with the Wi-Fi app, ironically named, Simpleconnect. The app didn’t appear to be user-friendly, providing spotty connectivity at best. This in turn led to endless frustration for numerous buyers. Reading past reviews, it seems apparent that where the Hunter Symphony was a let down for a lot of people had nothing to do with the fan, lighting, or remote control at all. Instead, it was in the smart technology arena. One reviewer after another expressed their frustration and disappointment. It seems the app itself was problematic from the get-go and seemed to cause Wi-Fi connection issues. And without the app dong its job, all buyers were left with was a somewhat expensive ceiling fan. You and I both know that the whole point of buying “smart” technology is to make our lives a little bit easier. We enjoy the comfort and push-button convenience and are not afraid to pay for the privilege. And once one experiences the ease of smart appliance technology, who wants to go back to doing things the old way? When you order the Hunter Symphony, you get a large, three-bladed fan weighing 25 pounds and measuring 14.6 inches high and 54 inches in diameter. Also included is a full-function remote control device and a 9.8 Watt LED light. This is equivalent to a 75 Watt incandescent light-bulb and provides adequate – though not super-bright – lighting. 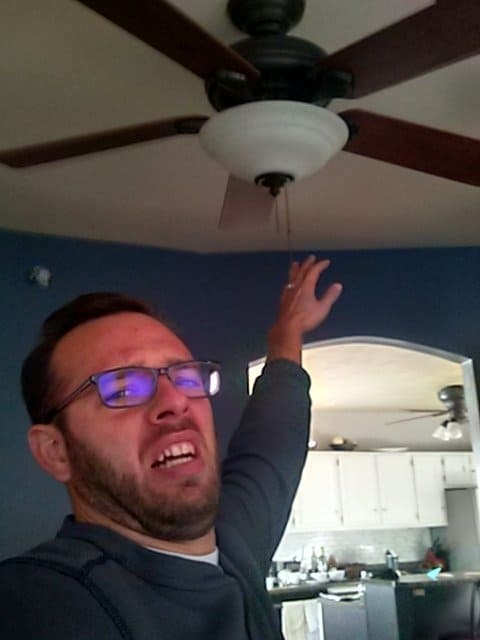 It’s important to note that this ceiling fan is made for indoor use only. Please do not set this up on your canopied porch or deck. It’s just not build to withstand the weather and you would likely be voiding your warranty if you were to do so. This product can work in any medium to large-size room. Any ceiling height will do as well. But the higher the ceiling, the longer the down-rod you will need to install with it. 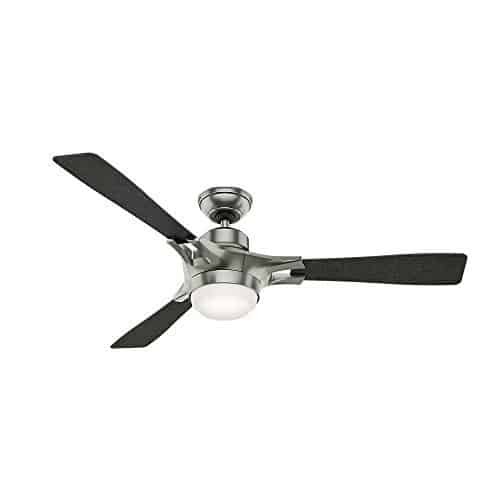 The Symphony is one of several smart home ceiling fans offered by Hunter. There is also the Hunter Signal and the Hunter Apache. All models feature different hardware and have a unique look. 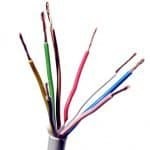 All are built to be used with Wi-Fi enabled devices, using the same Simpleconnect app. Manufactured to fit the standard American 120-volt household circuit, the Symphony offers a variable speed fan and energy-saving features. But the most impressive thing about this ceiling fan (apart from its stylish look) is its airflow capacity of 5730 CFM. At high speed, you can count on the Symphony to move a lot of air. Most components of the fan are covered by a typical, one-year warranty. But the powerful, built-in motor comes with a limited lifetime warranty. While the remote control is somewhat small in size, it is supplied with a matching black pocket that you can mount to the wall, as you would the light switch to the room. You can actually use the remote while it’s in the holder, much like you would use a wall-mounted switch – with multiple functions. And it’s easy to slide out of the pocket to hold in your hand, the way most of us use our remotes. The Symphony is generally quiet with the most notable noise coming from the swirling blades as they slice through the air. Unlike most low-end fans on the market, noise generated as the motor powers up to high is minimal. There’s the beeping you’ll hear as commands are received by the fan. But this option can be turned off if you prefer. Hunter has been around a long time – 125 years or so. And clearly, they manufacture quality fans. But it appears they dropped the ball when they first entered the “smart appliance” market. What’s just as disturbing is they proceeded, completely oblivious to the voices of consumers online who pointed out the problems and, rightfully so, wanted solutions. With the premium price tag attached, you would expect the Symphony to perform flawlessly as a smart device. But it’s the “smart” part that’s been the biggest source of trouble. This is unfortunate because the Symphony is a terrific fan and always has been. It’s a quality product. Controlling it via the app isn’t (and possibly, never was)a requirement. You just need to connect the app long enough to synchronize your fan(s) to Alexa, Apple HomeKit, or Google Assistant. Do this and you could easily manage everything using just your voice. Voice control with the Hunter Symphony seems to be much more reliable than the Simpleconnect app. One workaround is this: If you have Apple Homekit, you can avoid the dreaded Simpleconnect app altogether. Just use the Homekit app to detect and connect your fan – and you’re good to go. It could be that Hunter has finally started listening to customers and adapting to the requested changes, including a possible upgrade to the software. I say this because some buyers have nothing but great things to say about their experience buying, setting up, and using the Hunter Symphony Ceiling Fan with Wi-Fi. One change they have made is to replace the daylight LED with a soft-white LED light instead. 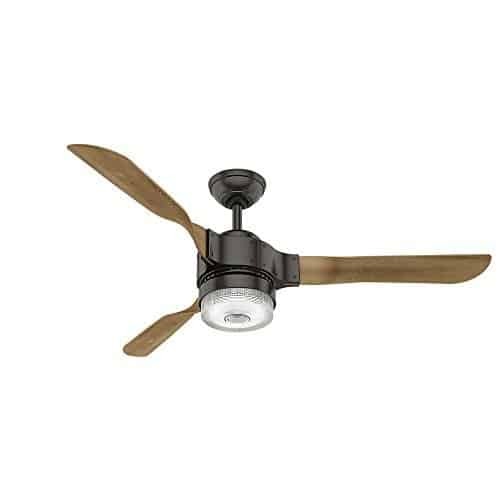 These people express a much higher level of satisfaction and several have recommended the Hunter as their ceiling fan of choice. But all those negative reviews slamming Hunter and its Symphony Ceiling fan remain present, for all to see. I can’t even imagine the cost of these blunders to Hunter, in terms of lost business. But I’m sure that a lot of potential buyers opted for something else instead. Overall, there are more positives offered by the Hunter Symphony fan than negatives. But due to the recurring problems right out of the gate, and Hunter’s apparent lack of response for a long time, I cannot in good faith recommend it wholeheartedly and give it my two thumbs up. Hunter makes great fans – of this I am certain. But until they get up to speed with the “smart” element of these mechanical devices, some uncertainty still remains. This means that you could experience problems at the set-up stage, or the Symphony could work perfectly for you. While you are protected from a cost point of view with the product warranty, there’s just no way to get back any lost time and who needs more frustration in their lives, anyway? 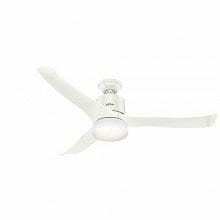 If you’re looking to outfit your home with a smart ceiling fan and these Hunter fans don’t seem too appealing, I recommend taking a look at Haiku fans. They’re more expensive, but they’re REALLY nice. Or, if you’d prefer to go the more economical route, there’s plenty of options to add smart control to old ceiling fans.